Keeping client brands out of the headlines is often as profitable as PR campaigns to secure positive press coverage. With that in mind, this story on the BBC website about the murder of Joanna Yeates made me wonder if the Asda crisis PR team will be jumping into action. Why is this an Asda crisis PR story? 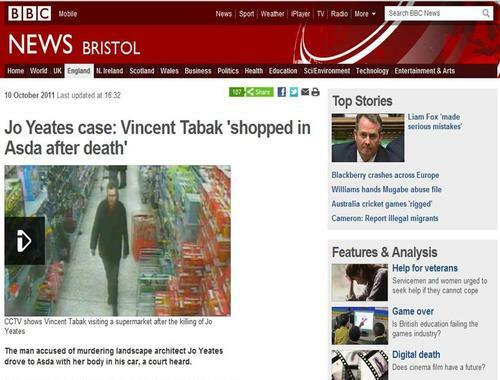 The fact that the murderer was visiting an Asda supermarket is by and large irrelevant detail. It could have been a Sainsbury’s, Tesco or a Waitrose. Asda doesn’t need to be mentioned in the headline, or, one could argue, in the story at all. The story should be changed and Asda’s name removed. My advice would be to liaise with the journalists to request for Asda to be removed from the story, or its prominence to be lowered, perhaps by moving this detail to one of the end paragraphs. You might think that the horse has bolted on this story, and that changing this doesn’t really matter, but corporate brands are one of the biggest assets of any organisation. These details do matter. Remember: ‘Google never forgets’ – it is never too late to clean up a story. If this detail gets changed then the Asda crisis PR team deserve a pat on the back. In fact they probably deserve one anyway as all sorts of crises and issues crop up for most high profile retailers like Asda. The likelihood is that they have killed off a fair few stories before your eyes got to see them. The other consideration is that brands need to know which fights to fight. It is not always possible to put press office resource on issues such as this. However, if brands spend so much time chasing often spurious mentions in lowly media titles, then why not spend a little more time cleaning up the mess created by others too?